I've been drinking green smoothies almost every morning for about 3 years. It makes me feel all healthy and filled with vitamins. My recipe of choice these days: kale, frozen berries, banana, almond butter, ground ginger, cinnamon, chia seeds, apple cider vinegar and water. I'm a creature of habit but I was intrigued when I found a recipe that included zucchini in a green smoothie. The recipe is for a smoothie that helps kids get their veggies, which are lurking underneath bananas, chocolate milk and peanut butter. While I love the idea of chocolate milk, this 30-something can get by without the extra sugary goodness. Anyway, luckily I had some neglected zucchini in my fridge so I could experiment with this new smoothie. And I was pleasantly surprised with this new addition to my morning. Plus banana and peanut butter is always a winning combo in my book. I also tried a version of it that subbed in almond butter--it wasn't as tasty but still pretty good. Change is good! I'm excited to alternate between my old green smoothie and this peanut buttery one now. 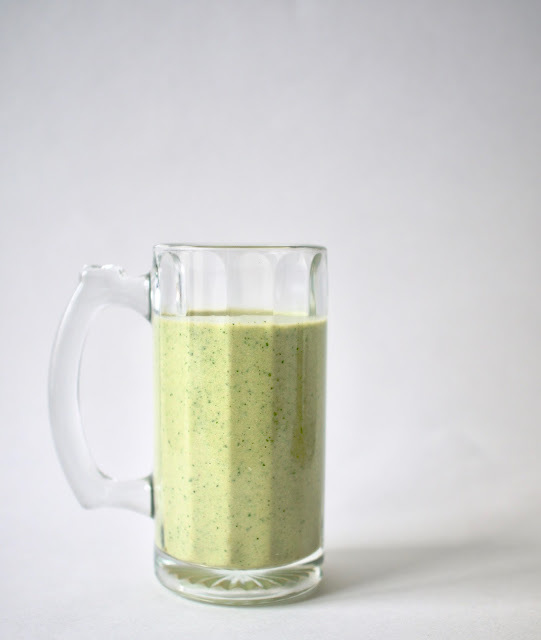 The Recipe: Peanut Butter and Chocolate Green Smoothie from The Kitchn. Feel free to put in any kind of power greens, nut butter/milk of choice and chia seeds.